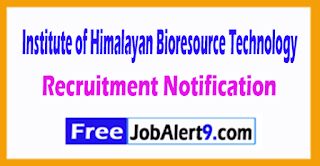 Institute of Himalayan Bioresource Technology (IHBT) Issued a Advertisement For Recruiting 03 Project Assistant.All Eligible And Willing Candidates Can Check Detailed Advertisement From Their Official Website And Attend Walkin Interview / Before 28-07-2017.Eligible & Interested Candidates Can Check Detailed Information For Each Postion Such As - Eligibility Criteria, Qualifications, Age Limit, Selection Procedure Before Applying. Institute of Himalayan Bioresource Technology (IHBT) Recruitment 2017. Candidates Maximum Age Should Not Exceed 30 Years As On 08-07-2017For Postwise Age. Salary And Grade Pay Scale: INR Rs.14000/-. Candidates Must Pass M.Sc. in Food Technology / Food Science And Nutrition Biotechnology, Chemistry Industrial Chemistry Or "Its Equivalent Qualification From A Recognized Board / University. Candidates Can Should Attend Walkin Interview On / From28-07-2017. Address :CSIR-IHBT Palampur, District Kangra, Himachal Pradesh . Important Dates : Last Date for Walkin Interview Is: 28-07-2017 . Click Here For IHBT Recruitment 2017 Detailed Advertisement.